Hope you have a great weekend! See you on Monday. 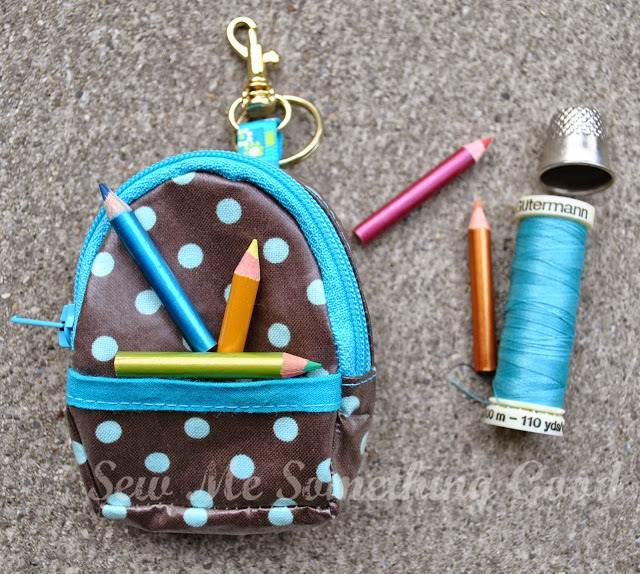 If you're a regular visit to this blog, you will already be aware of my tendency to make little zip top bags or pouches like this one or the one pictured below. 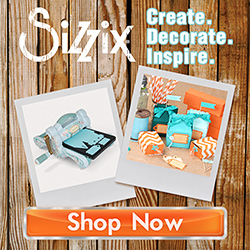 By simply changing the fabrics on this basic design, you can make something a little more playful in style. This project has it all for me. 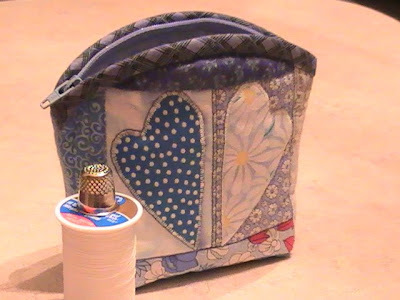 I get to indulge in my addiction to patchwork quilting, use up some fun scraps (from this quilt) and recycle a zipper that was from a pair of worn out jeans. 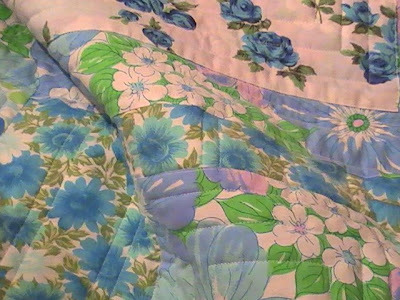 Vintage Blue Sheet Quilt Complete! 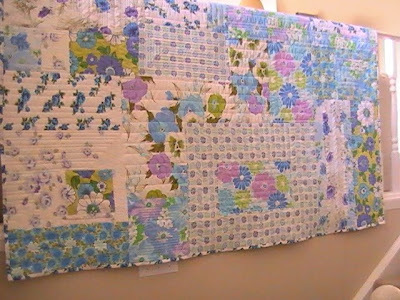 I finished and couldn't wait for a sunny day before taking pictures to show you my quilt made from thrifted sheets and a couple of pillowcases. 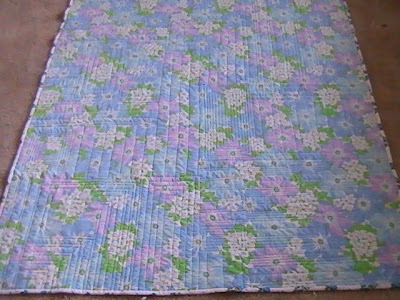 The pattern for this quilt is in the book, In Stitches. Anyone familiar with this pattern can see that I didn't use the recommended fabrics - vintage sheets are nowhere near the weight of the decorator weight fabrics shown in the book's version. 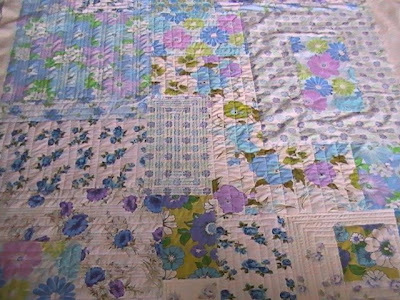 I also didn't follow the directions given for assembling the quilt, which means I didn't stitch the fabrics to a foundation, I pieced them together. 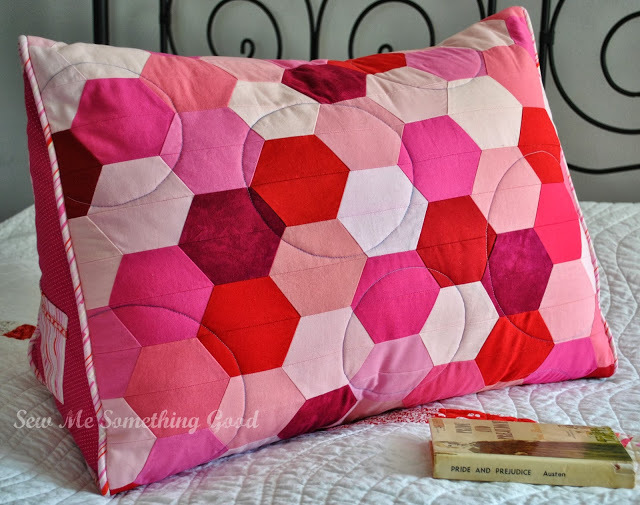 The quilt in the book has geometric quilting, but again I didn't quilt exactly as the book shows. 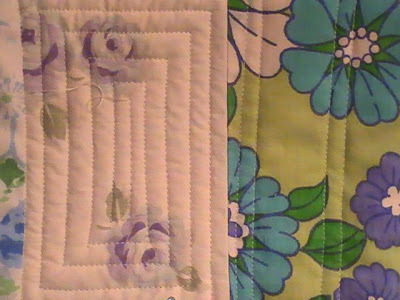 When I got to the machine quilting step, from block to block I just chose a different width between stitched rows and varied the direction to keep it interesting. 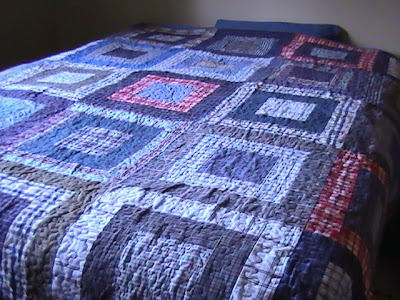 I wanted each block to be stitched differently and I managed to do that for every block on this quilt. I think I like the backing of the quilt as much as the front. All those rows of quilting are easier to see from the back. I am so pleased with how my quilt turned out (I'm just sorry about the off-colour photos... we've had so many overcast days lately that I grew impatient waiting for the sun so I ended up with these poor shots in terms of colour). 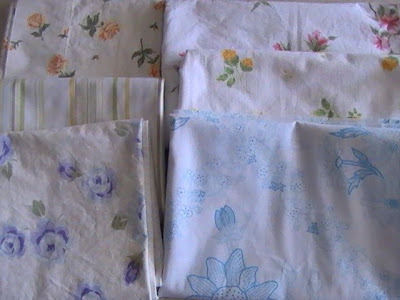 It has been fun giving new life to old linens. 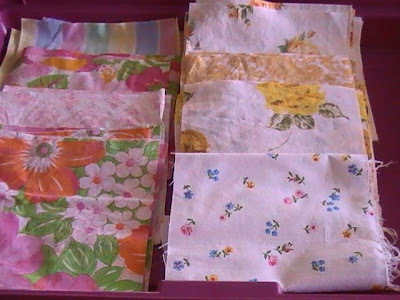 I will definitely be making more quilts from vintage sheets. 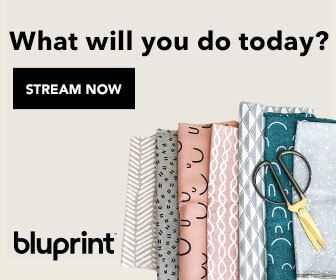 I cannot resist those retro fabrics! 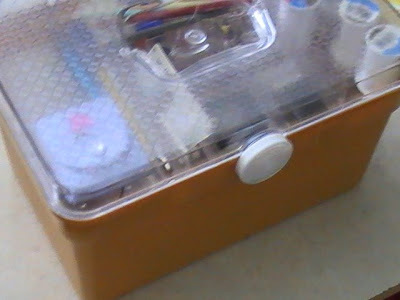 and my newest sewing notions chest, also from the thrift store. 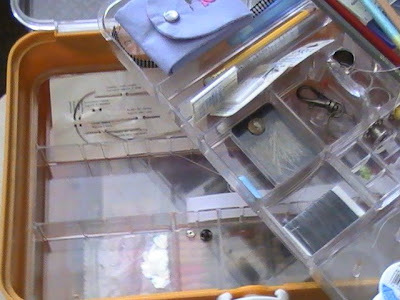 I couldn't believe the sewing organizer was in brand new condition, complete with little plastic dividers to be used to compartmentalize the two storage trays. 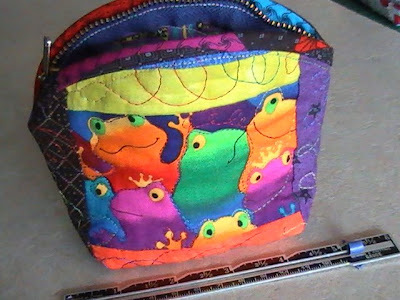 I've already been putting this organizer to use in my sewing area. 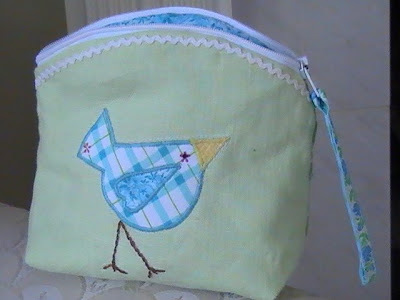 It was exactly what I had been needing to keep the small bits and bobs I like to keep on hand for sewing close but not scattered. I find it funny that sometimes I seem to end up bringing home things in a matching colour scheme. This time around, retro yellow is the colour! 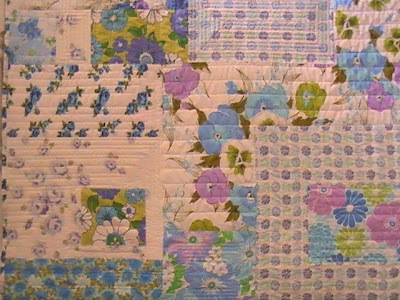 of machine quilting on my vintage sheet quilt has finally come to an end and I'm about to start the binding, but I couldn't resist showing you another peek at it during the quilting progress. Hope you're enjoying a fabulous weekend! I'll been going through boxes this week to clear out some clutter and have been finding all sorts of stuff from my past. Let me show you a couple of things I made as a kid in the early 80's.... 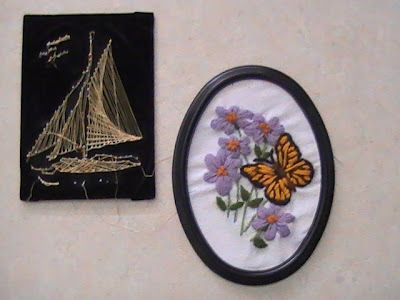 Both of these were made from kits that belonged to my great-grandmother (she taught me to sew, crochet and do needlepoint ). My love of needlework comes directly from her, I believe, since she was the one into all kinds of handcrafts and always fed my curiosity to try each and every craft. I wanted to be able to make all the beautiful things she did and when she showered me with praise and encouragement, it kept my spirits high even when my attempts failed miserably. The string art on the left I made in '81 and I specifically remember looking at the instructions and not wanting to be bothered with the string wrapping directions after figuring out where to place all the pins, so I just did my own thing. Obviously, I did not have the tying off step right; just look at all the loose ends dangling, but I do remember being pretty pleased with my results at the time. 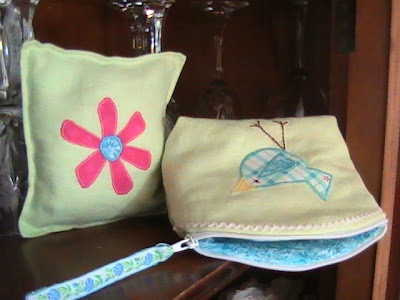 The stitchery on the right is my very first attempt at crewel embroidery. I think I was around 12 years old at the time I was shown how to do this. I fell in love with learning the various stitches and now use the same stitches in doing embroidery with cotton floss. It's fun to see the project that helped me get to where I am today. Along with enjoying the gorgeous (hot!) weather we had for the first half of our long weekend, I did get to spend some time sewing. 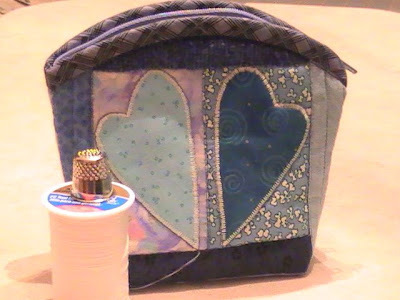 For some scrappy fun, I took the blue fabric pieces that Amandajean sent and made a little quilted bag from them. I also finished piecing the quilt top (thanks to Roxanne for finding the final piece I needed!) 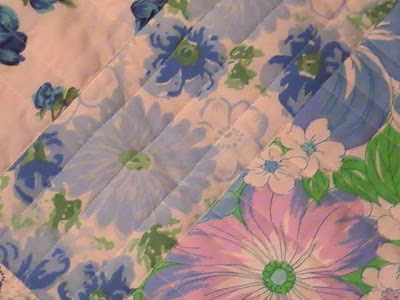 on my vintage blue sheet quilt and began the machine quilting. 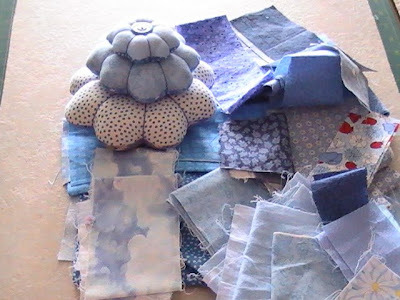 I'm having a blast just making up the quilting design as I go along. 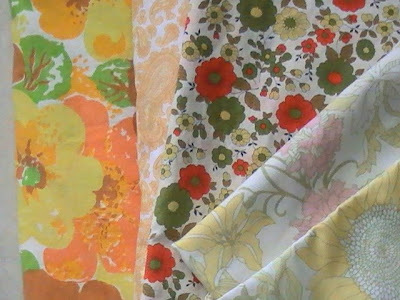 I'm loving the look of all these vintage fabrics together. Here is the gift I gave you a sneak peek of a week ago. Yes, another zip top pouch made from linen and cotton. 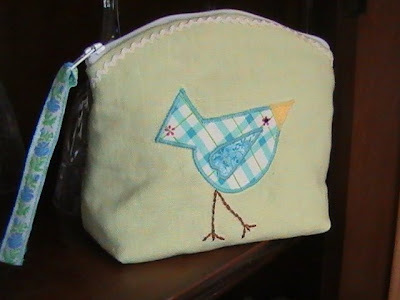 My friend mentioned how much she liked the first "bluebird" bag I made, so I thought I couldn't go wrong making her one of her own. 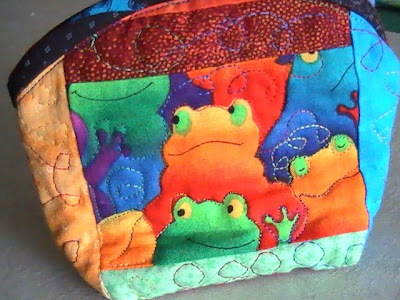 The pattern for the pouch comes from the book Sew Pretty Homestyle and the applique was my idea. The back of the bag needed nothing more than a wee bit of vintage ric rac to adorn it. I love those polka dots! 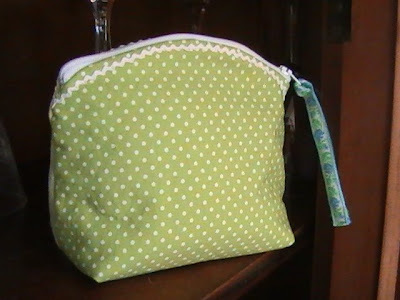 I also used the green linen to make a sachet to match. 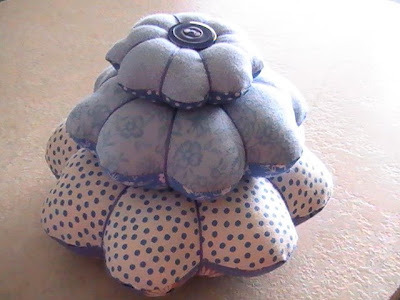 It's made like a pillow cover. 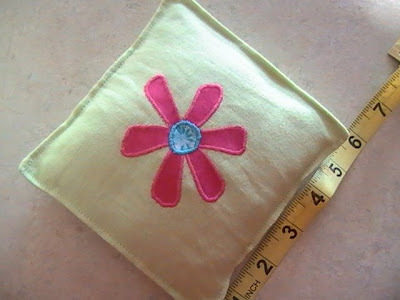 Merely, a square with a very simple applique design on the front, with a lapped back so that I can tuck a "pillow" filled with dried lavender I grew inside the linen sachet. It smells heavenly! I'm a novice knitter. I have only been at this craft on a limited basis over the past couple of years. Rather smugly, I thought I had the hang of sock making. I thought I was moving up in the knitting world. My skills were improving or so I thought. I'd tackled my first knitting goal - hand knit socks. Wahoo! Then I noticed that my hand knitted socks looked different. Noticeably different and I'm not talking about how bright and stripey they are ;o) Maybe my photos will explain it best. 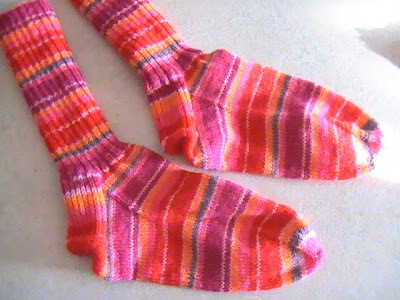 I've knit these two pairs of socks in the same yarn and needle size which will allow you to see what I've been doing. Yes, there is a difference in the leg of the socks. 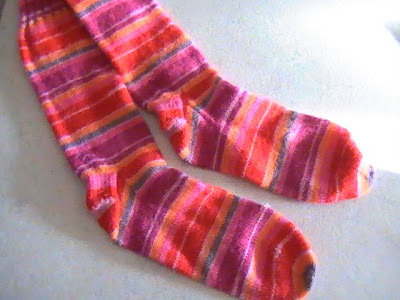 The latest pair, shown above have the leg in rib stitch only; while the first pair, shown below, have rib knit at the top of the leg and stockinette stitch for the rest of the leg. That's not what I'm trying to draw your attention to. Do you see the difference in the heel of these two socks? Ah-ha! I messed up the heel - not the turn heel though (which is actually the trickier part to manage when you're first starting out on socks... go figure how I could mess up the easier part). I misunderstood what I was supposed to do in this part of the sock pattern (but didn't realize it... and have knitted... um... hanging my head here... about 3 pairs of socks with wonky heels before catching on). Whoops! That would explain why my socks weren't quite so comfortable in the heel area, not to mention why they look so shrunken and tight. Do you want to know the saddest part of this tale? I only figured out what was going on when I tried using a different sock pattern. You do know what that means? 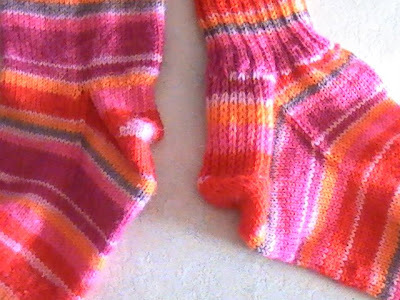 If I'd continued to use the same pattern, I would likely have continued to knit up socks with wonky, shrivelled heels. Nice, eh? I had to laugh at myself and I have been enjoying my "new" way of knitting the heels on my socks. My feet will be thankful for it when wool sock wearing season returns. I probably shouldn't tell you that my second knitting goal in life is to make a sweater. It might be wisest to let my knitting skills grow before I decide to tackle that! Guess what? I have the 'missing piece'! Yay! It arrived here thanks to my friend, Roxanne. Just look at the vintage beauties she sent me in her swap package. 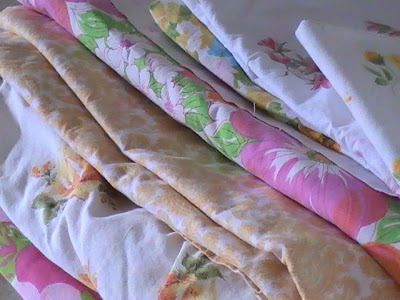 Now, not only will I be able to finish my first vintage sheet quilt, but I have what I need for my second one ( a pink and yellow quilt). 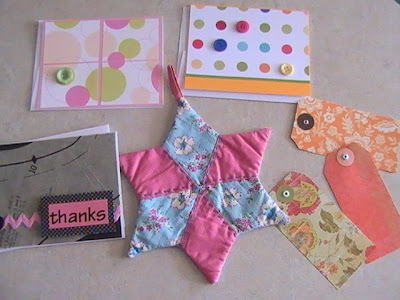 Along with the vintage sheet pieces, Roxanne also included these lovely handmade cards and tags (she's trying to woo me into starting another hobby... paper crafts... and I tell you, the temptation is getting too much to resist when I see such inspiration from her). and boy, was she right! 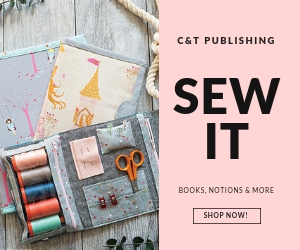 There's the softness of the cotton fabric, its sweet pattern and then how can I not admire the teeny, tiny hand-stitching that put it all together. Love it! Thank you so much Emma and Pam! and some applique. I really can't show you more because I'm afraid of spoiling the surprise. Sorry to post a teaser like this, but I promise to show it to you after she's received it. Pretty amazing, isn't it? Yes, in the span of two weeks I have had some wonderful treats in my mailbox. There's been squeals of delight to go along with the 'happy dance' with every parcel I've opened. 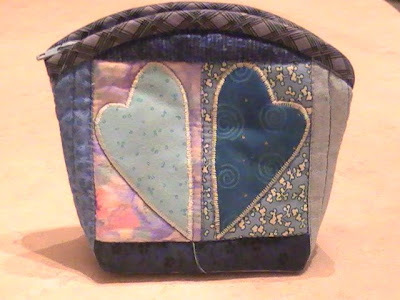 In exchange for one of my needlebooks, Amandajean made me a beautiful pincushion (my pictures do not do it justice) and then because she knows my love for scraps she fattened the package with some scrappy goodness from her own collection. 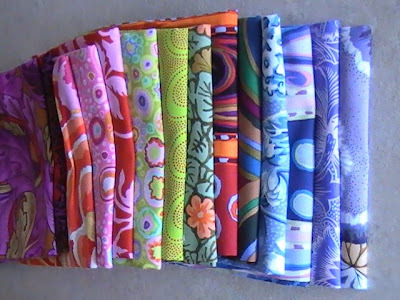 Boy, does she know how to make this fabricaholic happy! This much needed beauty is stationed for duty next to my sewing machine and the scraps are already laid out for a project. Thank you so much, Amandajean! Just look at the lovelies I received from Amy recently (and couldn't post about until I was back in the land of taking digital photos...). I know! It looks like I've been extra lucky lately with receiving so much goodness in the mail. The note cards are so pretty that I just want to keep them for myself! The cute hand embroidered hair clip is now my favourite and the water bottle lanyard is such a clever gift. I love them all! Now about that charming fabric on the left.... Amy sent me a piece of a vintage sheet in hopes that it would help me finish the blue quilt I'm making from vintage sheets. It was so thoughtful and generous of her! 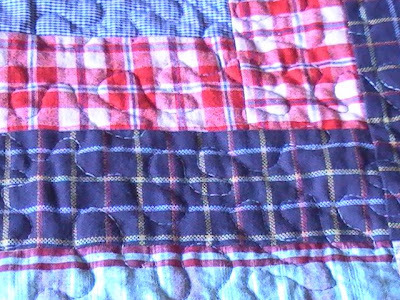 Here is the results of my idea of making a quilt from outgrown shirts from my son along with some thrifted plaid shirts to supplement. That's a lot of plaid - but my son loves his latest quilt and could hardly wait for me to finish it before adorning his bed with it. 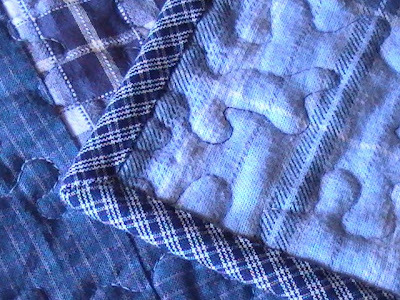 I decided to stipple quilt the mad plaid-ness of it all with a variegated blue quilting thread in both the needle and bobbin. 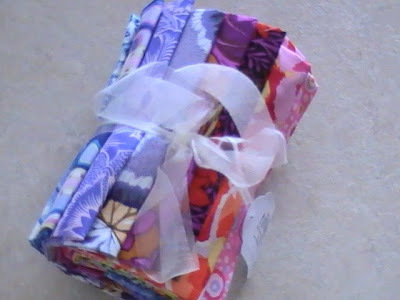 The goodness received from blog friends continued for me with the arrival of a package from Corry. Can you see why I was dancing with delight to receive this? First there's the beautiful fabric basket she made, which I immediately tucked a white bunny into and have them on display for spring . 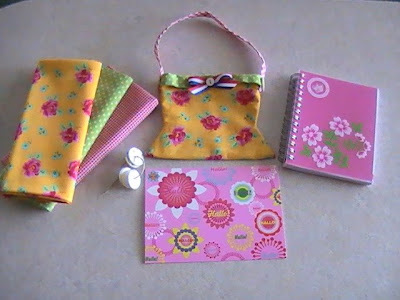 As if that handmade pretty wasn't prize enough for winning in her blog giveaway, she also sent me some of the lovely fabrics to use along with some sweet buttons and a cute pink notebook (how did she know this is exactly what I've needed in my purse?). 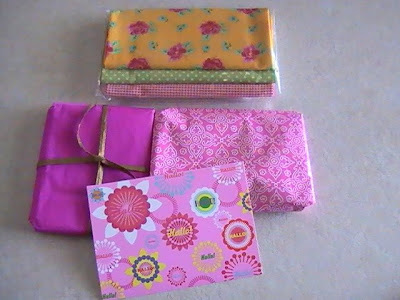 How could a girl not be happy with all this goodness arriving on her doorstep in gorgeous spring colours? Thank you so much, Corry! I'm so happy to be able to start posting with photos again! I definitely have some catching up to do since my digital camera went down. The first bit of goodness I've been wanting to show you arrived from my friend Nadine a couple of weeks ago. 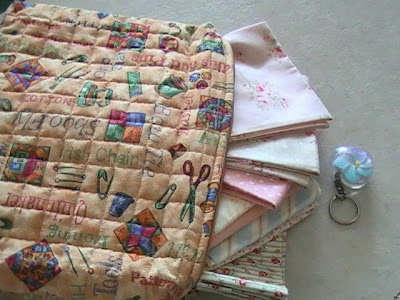 I love this beautiful quilted bag she made for me! 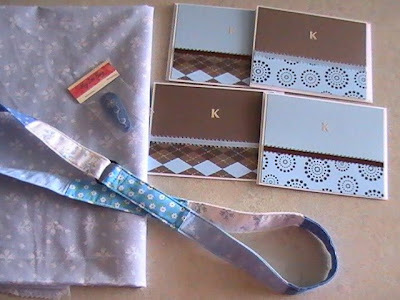 Inside it, she tucked these lovely fabrics along with a sweet flower keychain. My mind is envisioning all sorts of sweet projects I will make from them. I tell you, it's been hard restraining myself from cutting into them - but I did, because I had to get a photo of them to show you first! Do you want to know how I was so lucky to receive such treats? 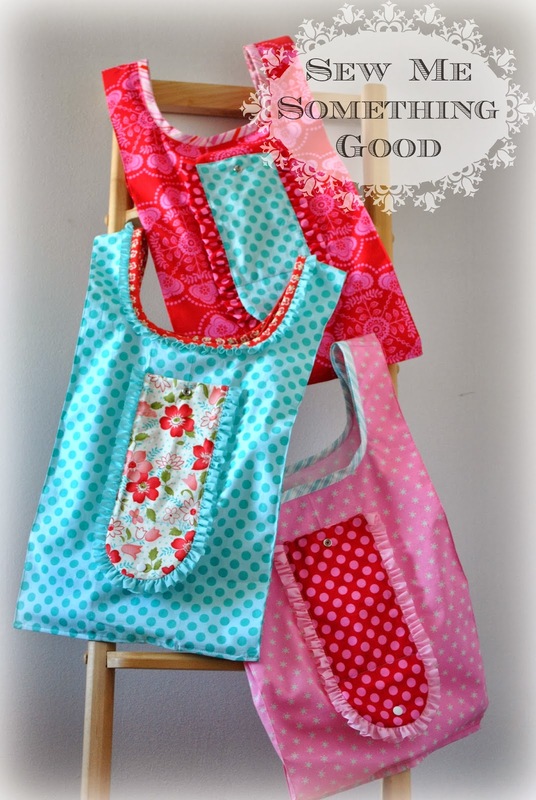 Nadine emailed to say she fell in love with the patchwork retro shopper bag I recently offerred as one of the choices in my blog giveaway. The winner of the giveaway chose a different bag as her prize, so Nadine asked me if I'd be willing to part with the bag that had caught her eye and from that one question we went on to do a swap that has made us both very happy. Today's photo is one taken during the earlier stages of this project. I ran out of the tapestry wool needed for the background on this stitchery. The amount needed to finish is about exactly the amount I had stitched in when I took this photo. There's your irony. It's just a short walk from my house to reach this vantage point overlooking my neighbourhood. The sunshine today makes this view all the more enjoyable and a good reason to get out of the house! Hope your day is filled with sunshine and good things. 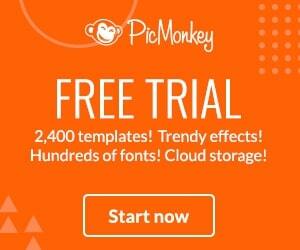 My Favourite for Photo Editing!